The Intelligent Stock Remaining Reports will give you a smart estimate of how much time you have left before a product will be out of stock. Each variant has its own Stock Remaining Report calculated by Shopventory based on the variant's sales history. You can also use Stock Remaining Reports to create Alerts. This report is only available on the Professional Plan and above. NOTE: If you don't see the option, it may mean there is not enough history for Shopventory to calculate a Stock Remaining Report. 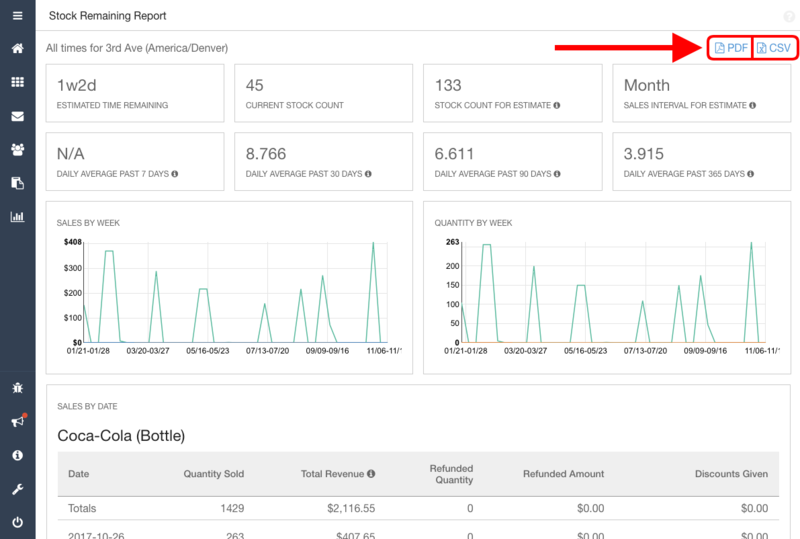 On the report, you'll see analysis of your sales for that product as well as estimates for how much time you have left. Shopventory has a complete sales history for every product in the inventory, so we use predictive analytics for our forecasting to give you the most accurate estimate we can. The more time and sales data we have, the more accurate the estimate, so Shopventory's estimates will only get better over time! Stock Remaining Reports are calculated once per day, overnight. You'll have updated Stock Remaining Reports ready for you each morning!